"But in another possible world, learning about modal realism would be exactly what you wanted before you died." "Not this one though." "No, not this one." Boethius was a Roman philosopher in the 6th century. 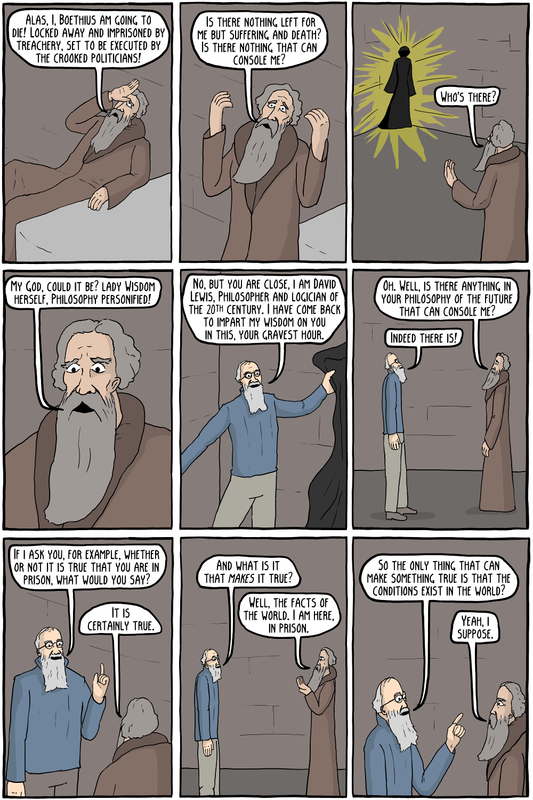 He is best known for The Consolation of Philosophy, which he wrote in prison as he faced execution. He was visited by "Lady Philosophy", who reminded him that through the philosophy of Plato and Zeno there was nothing to fear in death. True happiness lies in contemplating the eternal, perfect forms, and accepting things beyond your control. The work was extremely influential in early Christianity, which ending up borrowing heavily from Platonic philosophy and Stoic ethics. David Lewis was a 20th century American philosopher, best known for positing that all possible worlds exist (this is called Modal Realism). 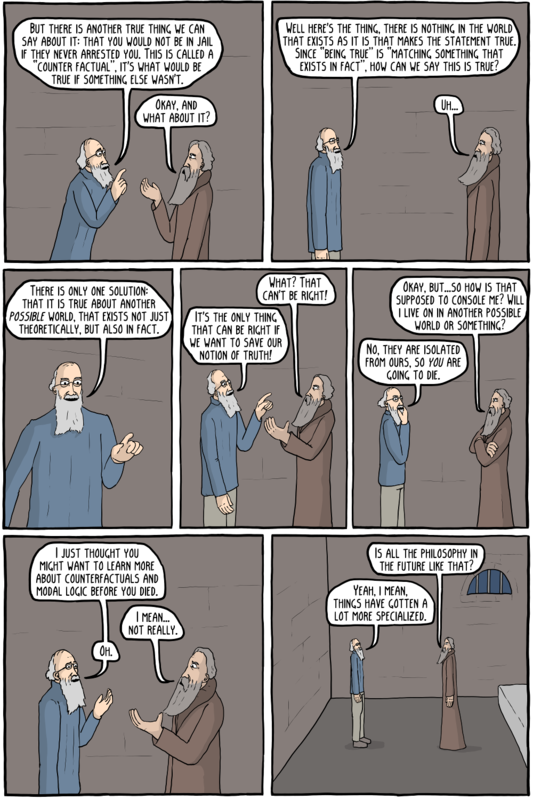 Like the comic says, this was due to his problem with counterfactual statements, and what he believed was the only thing that could rescue his theory of truth. This is probably one of the best modern examples of a philosopher "biting the bullet", and going all the way with their theories in order to avoid conflicts, although David Lewis is certainly not the first to accept a fairly crazy sounding theory because he saw no other way out. In fact it is one of philosophy's longest and proudest traditions.